While writing this, I feel like I'm floating in the air! I've been trying to read something about glucocorticoid pharmacology and therapeutics in preparation for our mid-semester exam on Tuesday but I just can't concentrate. I tried to get some sleep from two this afternoon, get up at four thirty and took a quick snack, back to bed again and slept until six thirty in the evening. This 'lack of sleep' feeling reminds me of my years in the broiler farm in Port Wakefield during harvest season and it opens my eyes to the reality that this sleepiness and exhaustion are nothing compared to what I had been having before. This physical state is a consequence of our dairy farm activities that started at four (that means I had to get up at two thirty) this morning as part of our Clinical Research Project this semester. 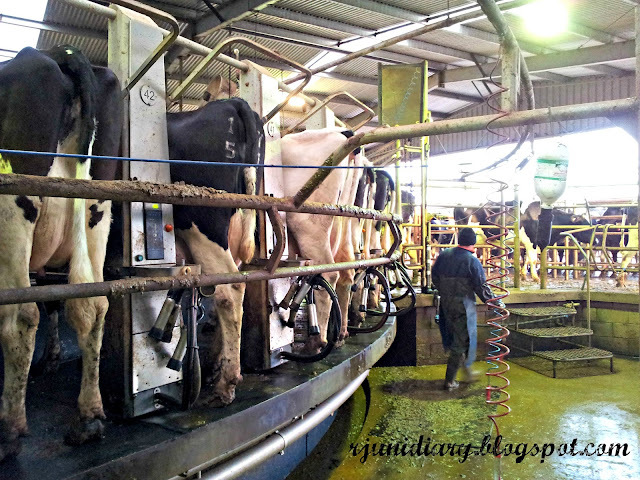 The milking parlour, South Australia. Luckily, we only have to come to collect data and milk samples twice; which means we only have to go back to the dairy farm one more time, then... we're done! Unlike the dairy farmer, the milkmaids and the milkmen. The have to be there early in the morning, everyday. I have personally seen their hard work and dedication, braving the 8'C temperature this morning to fulfill their duties and responsibilities to the dairy industry. I can imagine that as these dairy farm workers vigorously burn their energy while attending to the rotary milking parlour, most of the Australians were still snuggling in bed and will soon get up to enjoy milk with their cereals, yoghurt with their fruits, cheese in their sandwiches and butter on their toasts. But nothing really compares to these milking cows- the ultimate sources of milk. Their body (udder?) is just simply amazing! Just imagine the 40 litres of milk that each of these cows would produce in a day. Most of them didn't even have the opportunity to rear their own calf, they have sacrificed everything they have in order to produce milk for the consumption of the human populace. Just a thought: How can I thank these cows? I didn't know milking cows produce 40 liters of milk per day! Is that the high end or the average? Average milk prod'n po yan ng isang cow sa well-managed dairy farm.